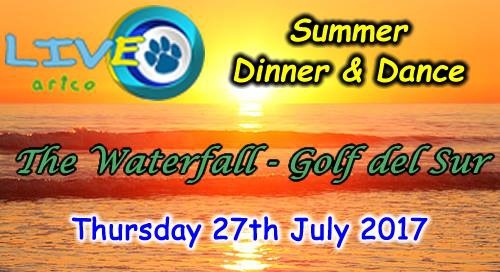 Enjoy a three-course dinner, live entertainment and dancing at the Summer Dinner and Dance at the Waterfall restaurant in Golf del Sur on the 27th of July. Choose / Pre-Book your meal selections from our excellent Menu (please see below). We have two great Acts for your Entertainment: Haley Butler and Jon-Paul Parker. So we're sure you'll be up and out of your seats having a good dance! All of this for just €25 per ticket. Please Note: Sit down for Meal 7.30 prompt. Dress Code: Casual / Smart. Golf del Sur, Los Cristianos & San Eugenio.